In 1946, Stratford based machine shop Belgium Standard recognized a growing demand within the material handling industry and Rolmaster Conveyors was born. 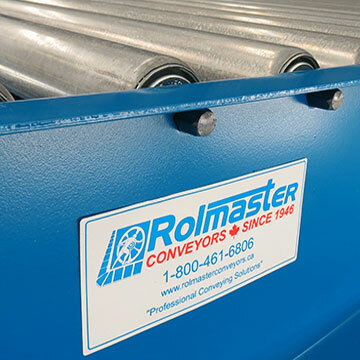 Over 70 years later, Rolmaster Conveyors is one of the most recognized and utilized conveyor manufacturers in Canada. Operating from their 38,000 square foot manufacturing facility in Cambridge Ontario, this privately owned company manufactures and distributes a wide variety of conveyor systems and related products within the following conveyor product categories: Gravity, Line Shaft, CDLR, Chain, Belt, Slat, Apron, Transfer Systems, Loose Rollers, Conveyor Accessories, Components and Replacement Parts. Our manufacturing facility operates in accordance with CEMA Standards. Rolmaster Conveyors sells standard product lines that offer value pricing and competitive lead times, but ultimately set themselves apart from most North American competitors by offering large-scale, highly-customized project development and material handling integration. Our in-house service department offers installation, maintenance and 24HR emergency services. Rolmaster Conveyors work with over 2,200 supply chain partners, selling to End Users, OEMs, Systems Integrators, Automation Development Firms, Bearing Houses and Material Handling Distributors. We offer discounted pricing to OEMs and Resale Supply Chain Partners to ensure that end users always receive the most competitive Canadian prices. To ensure highly skilled, well trained and passionate staff consistently assist all users and resellers of conveyors and related equipment & service select the most appropriate and cost effective material handling solutions in a timely manner; without compromising quality or functionality. To be the most recognized and utilized conveyor, related equipment and service supplier in Canada. Rolmaster will set service and operational standards by maintaining the largest and strongest mutually beneficial supply chain network within the material handing industry.